No need to cook, clean or worry about cash. 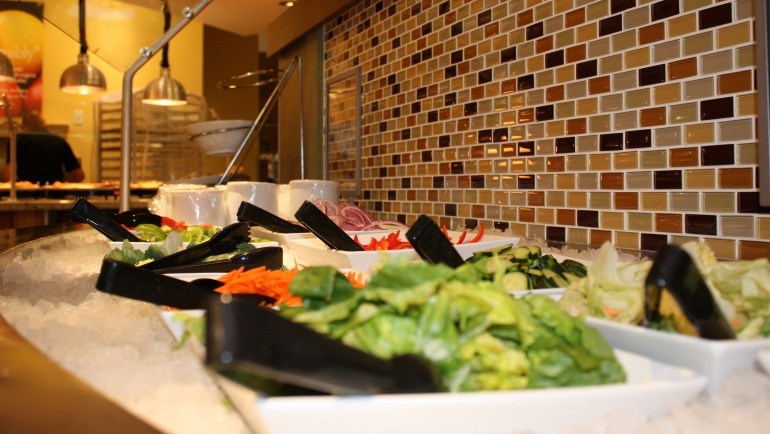 Healthy and sustainable food choices available. Quick and easy to make purchases on-the-go with your UBCcard. Track your account balance online and add dollars if needed. Carries basic meal dollars and/or flex dollars. Basic dollars are tax exempt; flex dollars are not tax exempt. Many places to eat on and off campus. 1. Bronze Plan—Only appropriate for students with small appetites who dine on campus during the week but rarely on weekends. 2. Silver Plan—Our default plan; for students with average appetites who dine on campus during the week and every other weekend. 3. Gold Plan—For students with large appetites who dine on campus during the week and most weekends. 4. Platinum Plan—For students with very hearty appetites who dine on campus the entire week. Students are automatically assigned a Silver Plan when accepting a residence offer and may choose to upgrade before the second payment is due or go online to add dollars if needed. Check out some Meal Plan FAQs. Not in the mood to cook? Students in Lower/Upper Cascades and Monashee Place can choose to purchase an optional campus meal plan for convenience and savings. Meal plan fees vary depending on the size of plan you choose. UBC’s on campus food services provider is able to accommodate specialty dietary needs related to health or religious beliefs. Please contact the food services provider for more information. Freeze your account online. File a report, get a replacement card at Student Services in University Centre, then reactivate your account. This section refers to all levels of Mandatory Meal Plan, Standard Plan and Semester Plan. Any unused funds, both Basic Meal Plan Dollars and Flex Dollars, will be automatically placed in a carryover plan. This carryover plan can be used for future on-campus food purchases but is 100% non-refundable, and cannot be redeemed for cash and/or applied as payment to any other UBC Food Services accounts. Once in the carryover plan these funds do not expire. 66% of unused Basic Meal Plan Dollars are refunded, with the remaining 34% retained by UBC Food Services. Unused Flex Dollars are refunded at 100%. All refunds are subject to a $25 administration fee. You may request a refund of your Flex Dollars only, and allow your Basic Meal Plan Dollars to automatically be placed in a carryover plan. The Flex Dollars will be refunded at 100% minus a $25 administration fee. Refunds are initiated once you have completed the refund form and residence check-out procedures. Refunds are processed using the initial method of payment. With respect to refunds please note that the 34% non-refundable portion of the meal plan covers the cost of making quality food services available for residents at convenient times. Read your Residence Contract for information about meal plan refunds before moving in.